Have you ever wished you could stamp with a bunch of like-minded girlfriends from the comfort of your own home? Your wish is granted--and your opportunity is March 26! This is a live, streaming event where we will stamp with the All Wrapped Up Bundle on page 6 of the Sale-A-Bration brochure. Order the bundle in time to have it at the event! Our projects will also feature the Sweet Sorbet Designer Series Paper, so you may want to order that as the FREE Sale-A-Bration product. Simply choose your preferred device--computer, tablet, smart phone, or even hook up your computer to your TV -- and tune in to learn some fun new things to do with the bundle! WHEN: March 26, 2014, at 5:30 PM, 7:30 PM, and 11:00 PM (all times Mountain Time). We'll demonstrate the same projects each time, so choose the one that's best for you. WHERE: You don't even have to leave home. Come to http://www.youtube.com/stampinupvideo at your chosen time, and be prepared to stamp! We'll also award door prizes to random participants. WHY: So many occasions are coming--Easter, Mother's Day, graduations, and more--and we want to help you be ready. Hope you can make it. We'd love to have you join us! 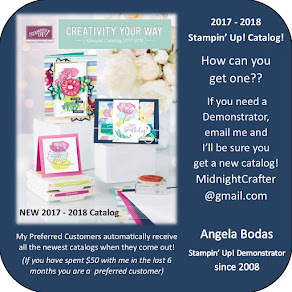 We will be stamping with the All Wrapped Up Bundle on page 6 of the Sale-A-Bration brochure. Order the bundle in time to have it at the event. Our projects will also feature the Sweet Sorbet Designer Series Paper, so you may want to order that as the free Sale-A-Bration product. 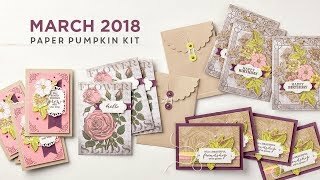 Here is some sample projects using the kit!